Facebook is never far from the headlines recently – and most of the news is bad. The latest scandal involves the Research program, designed to track app usage and web browser activity. The issue centres on an app called Research, and Facebook’s attempts to gather valuable personal data from Apple iPhone users – including those aged under 18. The Apple iPhone has a reputation for being more secure than Apple devices because of the way that personal data is protected on the device. Normally iOS apps are not permitted to access information from the Mobile Safari web browser; apps that break these rules are banned from the App Store. App developers are permitted some extra flexibility with these rules however, allowing them to test various additional functions that are not normally available. And it is this flexibility that Facebook Research exploited. Facebook users were encouraged to register for the Research program, and were then sent a special link to download the app. Because the app was designated as being for development use only, the usual security checks carried out by Apple were not applied. And so it was that Facebook were able to harvest vast amounts of personal data – including encrypted communications – from Research program participants. Facebook clearly broke App Store rules about app design and personal data harvesting which is why the Research app is no longer available. They were also temporarily banned from the Apple Developer program, preventing them from updating any of their apps – including the Messenger and Facebook apps. Facebook argues that everyone enrolled in the Research program gave their consent to have personal data collected, and that they were paid in return. However, analysis of downloads shows that nearly a quarter of registrants were aged 13 to 18. Users aged under 18 were supposed to obtain parental consent before sign-up – but there is little evidence that they did. Most simply had to select a checkbox, allowing them to verify consent themselves. Concerningly, most of these young users do not seem to have understood just how invasive the Research program was. Some will have realised that their web browsing activity was being recorded – but did they also know that virtually everything they did on their phone was being recorded and sent back to Facebook? Media reports suggest that they did not. For parents, the Research scandal should be a wake-up call. Allowing anyone, including Facebook, to have unrestricted access to personal data is a dangerous precedent, and teens need to be educated about the potential risks. Valuing and protecting personal data is a modern-day life skill, giving your kids greater control over their future. Helping them understand the risks of the Research app, and the importance of getting parental consent, will help protect them from unscrupulous marketers – and data thieves – as they get older. You can kickstart the conversation – and start protecting them immediately – with the Panda Dome security suite. With tools to filter content, limit app downloads and restrict personal data sharing potential, you can help keep kids safe while you teach them how to make wise choice. Click here to start your free Panda Dome trial today. The post Facebook targets teens’ data – do they really know what that means? appeared first on Panda Security Mediacenter. This entry was posted in Cybersecurity, facebook, Mobile News, parental control, social media on March 14, 2019 by Panda Security. 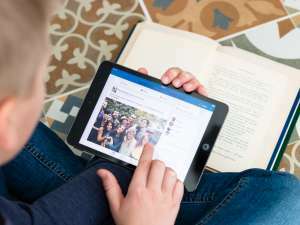 Many parents try to limit their children’s time on the internet by banning them from using popular social media apps such as Instagram, Facebook, Snapchat, and WhatsApp. However, children, especially the ones in their teenage years, are notoriously innovative in finding ways to communicate with each other even if their parents are very committed to remaining in control. And sometimes parents are being outsmarted – next time you check your kids’ screen time, and you see that they have spent a few hours using Google’s office suite, they might not have been working on the latest school assignment but chatting with other kids. The most recent trend amongst the youngsters is to use Google Docs documents as chat rooms where they share links, photos, and memes. Children can exploit Google docs by simply creating a document and adding all their friends as collaborators. Once all children have access to the same word doc online file, they can use it as a background to include text and communicate with each other. After they are done with the chat, youngsters tend to ‘destroy the evidence’ by deleting the online word doc. However, nowadays online behavior is no longer as anonymous as it used to be when the internet was born. Very often kids take screenshots or pictures of the chats as “evidence” and share it with friends and family. Youngsters are struggling to realize that online actions often lead to real-life consequences, as these screenshots could then be shared with anyone, including parents or teachers, and may even be posted on social media. Children will be children. They would always find a way to utilize the power of technology to express themselves. While chats on a spreadsheet in an online word doc sound pretty innocent, sometimes things get a bit heated. Bullies know that those “chat rooms” are not being monitoring and are used by them to intimidate others or to share age-inappropriate content. It is essential for parents to explain that any type of suspected cyberbullying or harassment needs to be reported to an adult no matter the platform where this has happened. Parents need to keep in mind that anti-virus software solutions often come with parental controls that allow them to have full control over their kids’ mobile devices. While this step is necessary, and the perfect way to stay in control of your children’s lives, mommy and daddy must remember that the forbidden fruit is always the sweetest. Teaching children how to behave online is as important as teaching them how to act in the real world. Limiting children from social media and preventing them from seeing explicit content is essential, but highlighting why those restrictions are being imposed is a must. At the end of the day, the forbidden fruit may not sound that appealing if you can explain to your little ones that it is rotten from the inside. The post Are Children using Google Docs to chat and bully each other? appeared first on Panda Security Mediacenter. This entry was posted in Family Safety, Mobile News, parental control, social media on March 13, 2019 by Panda Security.